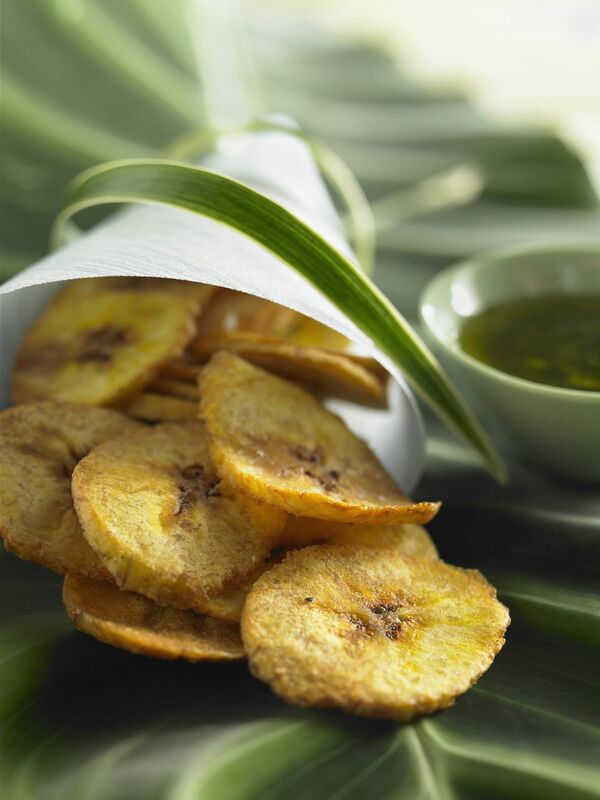 Chifles are thin slices of plantain that are deep fried and sprinkled with salt. They are a popular snack in Peru and Ecuador, where vendors offer bags of them to the passing cars. They are savory, more like potato chips than banana chips. Plantains become softer and sweeter as they ripen, and ​chifles are best made while the fruit is still yellow and firm. Serve them with guacamole as ​an appetizer or enjoy them as a snack. Cut off both ends of the plantains, and remove peel/skin. You may need to slice the peel open lengthwise with a knife. Work carefully because plantains can stain skin and clothes. Slice plantains crosswise into very thin slices. about 1 to 2 millimeters. It's fun to use a mandoline for this, but a sharp knife works great too. Heat 1 to 2 inches of oil in a saucepan on medium-high heat. When the oil is hot (about 360 F), fry several slices of plantain at a time until golden, 2 to 3 minutes. Remove and drain on paper towels. Season with salt to taste.